Manny (Ray Romano), Diego (Denis Leary), and Sid (John Leguizamo) set out on their greatest adventure when an entire continent is set adrift. Before the continent splits, Manny and his daughter Peaches (Keke Palmer) have a falling out. Although Manny tells Peaches she's not allowed to hang out with her crush Ethan, Manny catches her with him anyway and embarrasses her in front of all her friends. 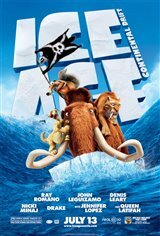 Soon after, the continent separates and Manny, Diego, and Sid are left stranded on an iceberg floating away from their loved ones. After surviving a large sea storm, the three friends find Granny (Wanda Sykes), Sid's grandmother, who was asleep in a tree trunk on the same iceberg. But just as soon as they discover her, they are captured by a group of pirates led by Captain Gutt (Peter Dinklage) and his first mate Shira (Jennifer Lopez). Making a daring escape, the gang gets away from the pirates, only to encounter exotic sea creatures, explore a brave new world, and again come face-to-face with the wrath of Captain Gutt.